Forget everything you know about traditional classrooms, professors, students and tuition for a minute, if you will, and consider an educational institution that allows individuals to interact and learn online without worrying about how they're going to cover next semester's tuition bill. That's precisely what Shai Reshef had in mind when he developed the concept for University of the People, the first tuition-free online university. Open since September 10, the non-profit institution comprises a diverse group of 178 students from 49 countries. Supported by a group of educators, humanitarians, and organizations like the UN Global Alliance for ICT and Development, the online university offers post-secondary educations in business administration and computer science. According to Reshef, founder and president, students kick off their UoPeople educations with two orientation programs (computer skills for online learning and English composition) that prep them for their chosen programs, which require passing grades in both preparatory classes. Involved in for-profit education for the last 20 years and named one of Fast Company magazine's most creative businesspeople for 2009, Reshef said he's confident in the unique educational delivery and business model. He spoke with Campus Technology about his new venture--how it will operate and what other institutions of higher education can learn from it. Campus Technology: How did you come up with the idea for UoP? 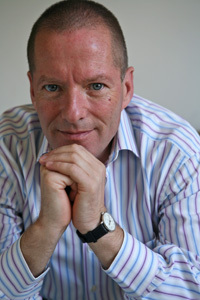 Shai Reshef: From 2000 to 2004, I served as chairman of KIT eLearning, the Netherlands-based eLearning partner of the University of Liverpool. It was there that I discovered the power of online learning, in particular how this type of education can be used to reach people all over the world. I also found out about the value of online interaction, having watched students worldwide study together at quite an impressive and effective academic level of study. The fact that people could earn their educational degrees while actively working was equally as impressive, and not always attainable in the "traditional" university setting. The problem is that even online educations were out of reach for many due to tuition costs. I sold my company in 2004 and moved onto other things, but what I learned during those four years of running it stayed fresh in my mind. I then got involved with an online study community, where students could help each other with homework questions. Through that online community I discovered the power of social networking, and the fact that people are willing to help one another without getting paid for their time and effort. That's where I got the idea to bring the concept of online social networking phenomena to academia. Through UoP, we can do great things online without the high price tag associated with traditional college educations. CT: How does UoP deliver that education? Reshef: When a student signs up, he or she is grouped with 20 other individuals whom they interact with and learn from via homework assignments, discussion questions, and lectures. Students discuss the questions among themselves and participate in a peer-to-peer learning environment. If at any point a peer can't help--or if a student needs more elaboration on a particular topic--then they can visit the course forum. There they will find all university students who are taking the same course, along with volunteers, professors and graduate students who can help with those issues. At the end of each week, students take a quiz on the material they've learned, turn in their homework and receive a grade. The same system is used for all 40 courses that comprise the program. Reshef: Thousands of prospective students applied to attend UoP and we currently have 178 students enrolled for the first term. With five terms per year, we allow students to commence their studies on a rolling basis. Right now tuition is free. As we expand, our sustainability model will require nominal admission and examination processing fees (of $15 to $50 and $10 to $100, respectively) to cover operating expenses. These fees will be adjusted on a sliding scale based on the economic situation in the student's country of residency. Students will never be charged for applying, taking classes, or accessing study materials. CT: What types of technology tools are you using to run UoP? Reshef: We like open-source technology, and have found Moodle to be both simple and effective for course and information delivery. Our secret weapon is the fact that we never reinvent the wheel unless we absolutely have to. If another organization is using a piece of open sourceware that we feel will work well for us, then we'll adopt it. Everything we use has already been tested by others and proven. CT: What's the hardest part of what you're doing? Reshef: Really we've been lucky in that everything is rolling out as planned. We just kicked off the first term, so come back in a week or so and ask me again. I may be able to tell you about the challenges. For now, however, we just don't have any. CT: What are your institution's goals? Reshef: Ultimately, we want to make higher education accessible to everyone, and to serve as an alternative for those who have no higher education alternatives. There are hundreds of millions of people around the globe who graduate from high school, but who are unable to attend college because they can't afford it--and because there aren't enough universities. Either they get in, or they're left out and wind up with very limited futures. With all of the global development and Internet usage we're seeing, it's a shame that these talented individuals have to stay home and miss out on successful futures. Thanks to our new model, it's now possible for them to get a good education without having to leave home. CT: What can other institutions learn from what UoP is doing? Reshef: The lesson we hope to teach is that education can be extremely effective and very inexpensive when combined with the Internet and technology. Universities were created to teach the masses, and not the few. We shouldn't be the only ones doing this.